Greenwood Anvil Collection Gallery : Images of anvils of the world. The anvil collection of Josh Greenwood, professional blacksmith and student of the art of anvil design for 40 years. Photos by Josh Greenwood of Greenwood Ironworks with digital processing by Jock Dempsey. This is one of seven image galleries including several major collections of rare and unique anvils. The anvils in the Greenowood collection are all either rare unique specimens or of the highest quality. These are all open die forged anvils, a product that has not been made in decades and is unlikely to ever be made again. The large German anvils are the finest tools of their type made in human history. "Anvil-itus", Over 2800 pounds (1270 kg) of anvils to be moved. . . Many of the anvils in this collection are available to purchase. For contact information or to ask questions go to Greenwood Ironworks . com Serious inquiries only. NEW Image! Graceful and symetrical hornless anvil from the Greenwood collection. A classic early anvil with unusual conical horn. 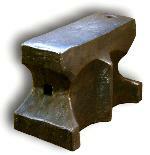 A classic block anvil with markings R.H.II. Has an interesting story of its origin. A classic old European anvil. Marked on flat side "VH = 245". A classic old European anvil. A classic old English made anvil with makers marks. A classic old English made anvil with makers marks. Now in the Colonial Williamsburg collection. Includes weld assembly diagram. A classic old English made anvil with weight marks. One of the best large anvils made anywhere, any time. South German style. With "Forget Me Not" stamp. Flat backed multi-position anvil. Probably German. A No.1 South German anvil (nearly the largest size) anvil. One of the best large anvils made anywhere, any time. A heavy pattern North German anvil. The difference between North and South German . 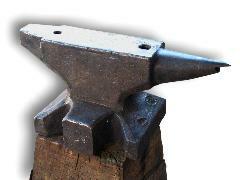 . .
English made Colonial era anvil with replacement horn. Small hardened and tempered jewelers anvil from the Josh Greenwood Collection. Ancient German anvil with roots in earliest Colonial America. 16. Hornless Colonial Anvil "S"
Hornless Colonial anvil with "S" mark. One of two anvils from the same maker. Hornless Colonial anvil without a fifth foot. A bomb damaged WWII relic, from the GHH factory in Oberhausen Germany. Before and repairs. With full screen slide show. Old low resolution digital of some of the anvil collection taken in 2000. Collection of Colonial anvils at Greenwood Ironworks photographed in 2009.